We sent a drone to capture progress of the nearly-completed Phase 1. May. 13, 2018, 12:30 p.m.
More than a year and a half after the October 2016 groundbreaking, the first portion of Philly’s new Rail Park is nearly complete. In total, the project to reclaim former rail lines for public use is destined to stretch three miles across the city. For now, the park’s friends group and the Center City District (which will oversee the park when it’s complete) are concentrating on Phase 1. This first portion comprises a quarter-mile segment of the raised viaduct. Specifically, it’s the part that curves from 11th and Callowhill over 12th and 13th and out to Broad and Noble, where it reconnects with the street. When it officially opens with a ribbon cutting on Thursday, June 14, the space, which was partly inspired by NYC’s successful High Line, will include benches, swings, plant life and artwork along the way. 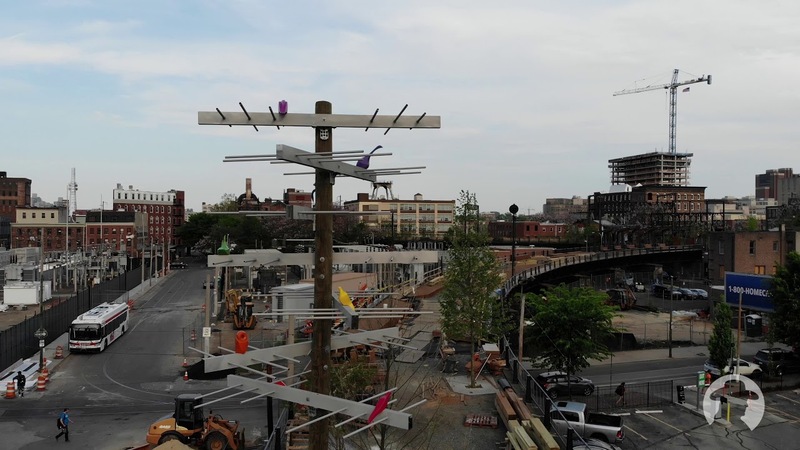 Check out Billy Penn’s drone video preview of the nearly-completed Rail Park Phase 1, and scroll down for more pics. Phase 1 will have three entrances, including one at Broad and Noble, where an old rail car will house the park’s headquarters. Landscaping of the Broad & Noble entrance has just begun. The park will also be accessible via a stairway at 13th and Callowhill. It’s a climb. There’s also an ADA-accessible entrance just before 13th Street on the west side. Giant swings, which were requested by neighbors when the park friends group asked, are made of wood and metal. Landscaping will include more than 1,000 trees and shrubs. Some plant life will continue to find its own way. A map made of perforated metal highlights landmarks of the area’s industrial history. A quote by Bajan poet Kamau Brathwaite graces part of the entrance walkway.